Toubkal or Tubkal (Berber: ⵜⵓⴳⴳ ⴽⴰⵍ Tugg kal; Arabic: توبقال‎ Tūbqāl) is a mountain peak in southwestern Morocco, located in the Toubkal National Park. 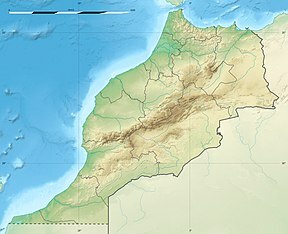 At 4,167 metres (13,671 ft), it is the highest peak in the Atlas Mountains, Morocco, North Africa and the Arab World. Located 63 km (39 mi) south of the city of Marrakesh, it is an ultra prominent peak, the highest for over 2,000 km (1,200 mi) and a popular destination for climbers. The first recorded ascent was on 12 June 1923 by the Marquis de Segonzac, Vincent Berger and Hubert Dolbeau, but the mountain may have been climbed before that date. The ascent during the summer (from May) is non-technical yet moderately difficult, only complicated by steep and slippery scree slopes and altitude sickness. Sturdy boots and proper (windproof) clothing are required, and trekking poles are helpful on the scree. An ice-axe may be needed on the remaining snowfields in the early summer. The ascent during the end of the winter and spring (February/March) is more difficult. Crampons are necessary to ascend through the snow and - in some cases - ice. It is possible to climb the mountain in two days - first day up to the refuge (around seven hours), second day to the summit (around five hours) and back to Imlil (up to five hours). In summer the mountains can be very dry, but are sometimes subject to storms. Although the temperature should remain above zero during the day, freezing conditions are possible over 3,500m. In winter the mountains are covered in snow and ice, and can be prone to avalanches. Skiing is possible as the snow can lie to considerable depth and cover many rocky slopes. Information about the state of the route can be obtained at Marrakech tourist offices or at Imlil. On 17 December, 2018, two trekkers, from Denmark and Norway, were murdered close to the foot of the trail by Islamists in a terror-related attack. Jbel Toubkal in December 1930. Air photo taken by Swiss pilot and photographer Walter Mittelholzer. Nearby villages of Asni, Ikkiss, Imlil and Tacheddirt. ^ a b "Africa Ultra-Prominences" Peaklist.org. Retrieved 2012-01-14. ^ Toubkal Massif Map and Guide (Map) (1st ed.). 1:160,000 with mountaineering information. High Atlas Mountains. Cartography by EWP. EWP and West Col Productions. 2008. ISBN 978-0-906227-98-5. ^ O'Grady, Siobhán. "Two tourists killed in Morocco — one of them beheaded — in likely terrorist attack". The Washington Post. The Washington Post. Retrieved 22 December 2018. Wikimedia Commons has media related to Jbel Toubkal. 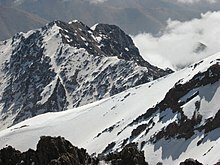 Wikivoyage has a travel guide for Jebel Toubkal. This page was last edited on 22 March 2019, at 07:00 (UTC).